This presentation contains forward-looking statements within the meaning of the federal securities laws. 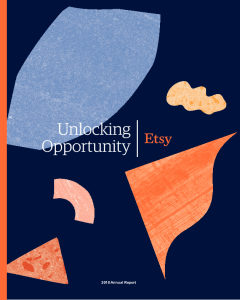 Forward-looking statements include statements relating to our ability to bring buyers back to Etsy.com and our financial guidance and key drivers thereof, including marketing spend and anticipated timing, anticipated product launches, investments in headcount and timing of our migration to the cloud. Forward-looking statements include all statements that are not historical facts. In some cases, forward-looking statements can be identified by terms such as “anticipates,” “believes,” “could,” “estimates,” “expects,” “may,” “plans,” “will,” “intends,” or similar expressions and the negatives of those words. Forward-looking statements involve substantial risks and uncertainties that may cause actual results to differ materially from those that we expect. These risks and uncertainties include: (1) the fluctuation of our quarterly operating results; (2) our ability to implement our business strategy; (3) our ability to attract and retain an active and engaged community of Etsy sellers and Etsy buyers; (4) our history of operating losses;(5) macroeconomic events that are outside of our control; (6) our ability to recruit and retain employees; (7) the importance to our success of the trustworthiness of our marketplace and the connections within our community; (8) our ability to enhance our current offerings and develop new offerings to respond to the changing needs of Etsy sellers and Etsy buyers; (9) the effectiveness of our marketing efforts; (10) the effectiveness of our mobile solutions for Etsy sellers and Etsy buyers; (11) our ability to expand our business in our core geographic markets; (12) regulation in the area of privacy and protection of user data; (13) our dependence on third-party payment providers; and (14) the potential misuse or disclosure of sensitive information about members of our community and the potential for cyber-attacks. These risks and uncertainties are more fully described in our filings with the Securities and Exchange Commission, including in the section entitled “Risk Factors” in our Quarterly Report on Form 10-Q for the quarter ended September 30, 2018, and subsequent reports that we file with the Securities and Exchange Commission. Moreover, we operate in a very competitive and rapidly changing environment. New risks emerge from time to time. It is not possible for our management to predict all risks, nor can we assess the impact of all factors on our business or the extent to which any factor, or combination of factors, may cause actual results to differ materially from those contained in any forward-looking statements we may make. In light of these risks, uncertainties and assumptions, we cannot guarantee future results, levels of activity, performance, achievements or events and circumstances reflected in the forward-looking statements will occur. Forward-looking statements represent our beliefs and assumptions only as of the date of this presentation. We disclaim any obligation to update forward-looking statements. At ETSY, we promise to treat your data with respect and will not share your information with any third party. You can unsubscribe to any of the investor alerts you are subscribed to by visiting the ‘unsubscribe’ section below. If you experience any issues with this process, please contact us for further assistance. By providing your email address below, you are providing consent to ETSY to send you the requested Investor Email Alert updates.